A late-afternoon view of the Interstate 69 freeway looking east from the Harmony Road overpass in southwestern Monroe County. This section of Interstate 69 opened to traffic on December 9, 2015. Photo taken by Thomas Decker, January 2, 2016. Interstate 69 has perhaps the most interesting of histories for Indiana interstates, largely because it is still a work in progress. The original 157 miles of Interstate 69 was finished in the 1970s. The highway was originally slated to start in Downtown Indianapolis at the Northern Split of Interstate 65 and 70, but local opposition pushed the start up to Interstate 465 on the northeast side. The first 10 miles of the interstate go through the growing suburbs of Hamilton County. Beyond there, it passes by the mid-sized cities of Anderson, Muncie, and Marion as it passes through flat, agricultural fields. North of there, it goes through Fort Wayne, the state's second largest city, before heading north through the moraine and lake country around Auburn and Angola. It crosses the Indiana Toll Road just as it leaves for Michigan. Then there is the 114-mile long southern portion of the highway. For many years, there was a need for an interstate to link up Indianapolis with Evansville. The current path between those two cities had been marked by a combination of various divided and undivided highways. 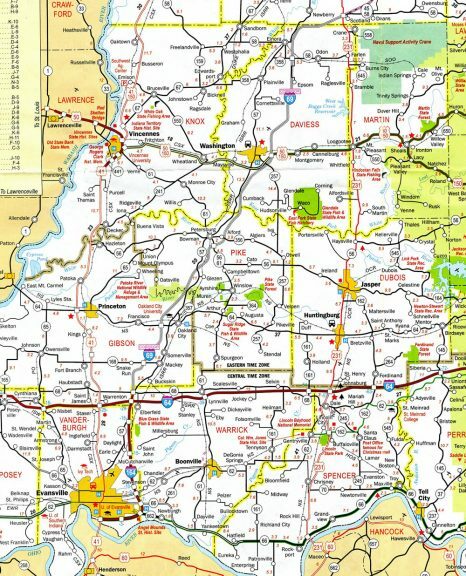 In the early 2000s, Indiana finally got to work on a finalized route and picked the current alignment in 2003. Despite fierce opposition from environmentalists and residents of Bloomington and Indianapolis (who are around the proposed route) the construction began in 2008 and on November 19, 2012 the first 67 miles of the extension were opened. The fourth section of the interstate opened to traffic on December 9, 2015 and runs another 27 miles from U.S. 231 to Indiana 37 in Bloomington. The 2011-12 Indiana Official Highway Map showed the initial stretch of new Interstate 69, the small segment linking I-64 and I-164 with SR 68. I-69 Section 1, Evansville to Oakland City, Section 2, Oakland City to Washington, and Section 3, Washington NSA to Crane were all under construction at this time. The new Interstate 69 begins at U.S. 41 in Evansville, a temporary terminus until the completion of a new bridge over the Ohio River to Kentucky (details to be determined). From there the interstate passes by the east side of Evansville and meets up with Interstate 64 in Gibson County and follows a path to the northeast past Oakland City, Petersburg, Washington, past the Crane Naval Support Activity Center and across hilly terrain to the northeast to a northern terminus at Indiana 37 south of Bloomington. 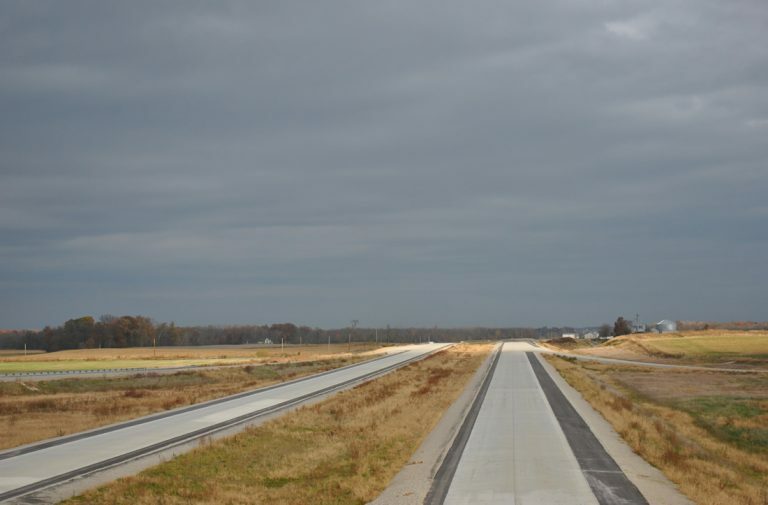 The December 2015 opening of Section 4 finally connected Bloomington with Evansville and created a four-lane highway connecting Indianapolis (via Indiana 37) with Evansville (via Interstate 69). 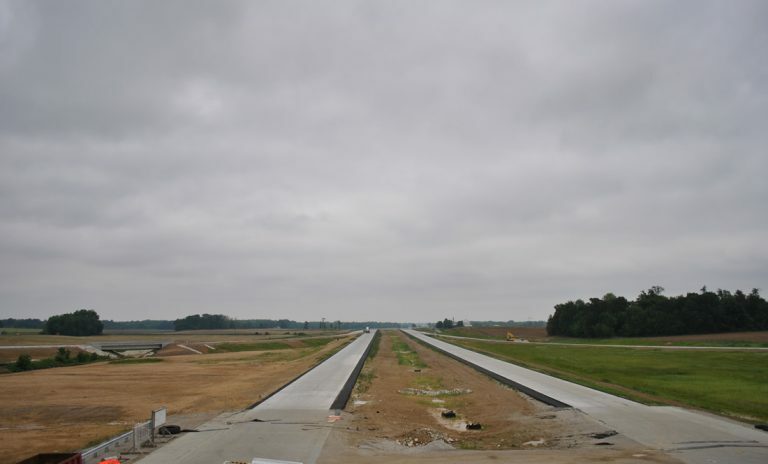 The overall highway will be around 330 miles in length, connecting the three largest cities in the state of Evansville, Indianapolis and Fort Wayne. As of 2015 it is now the longest interstate in Indiana, running for 272 miles in its two sections. Section 5 of the interstate, upgrading the Indiana 37 expressway between Bloomington to Martinsville is slated for completion in late 2016. The path for the sixth section from Martinsville to Interstate 465 in Indianapolis is still to be determined with construction still several years away from there. 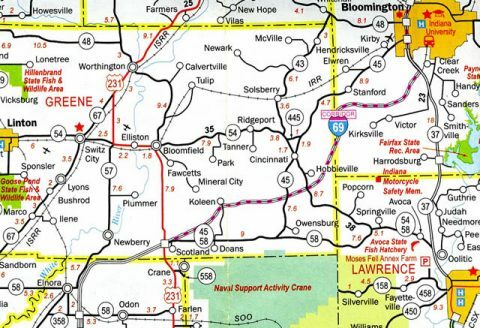 Continuing Interstate 69 along Indiana 37 from Martinsville to Indianapolis was INDOT's first choice and still the presumed routing until further notice. Concrete roadways of future Interstate 69 awaited traffic in this scene looking north from the SR 57 south & 68 overpass near Wheatonville. A tributary of Pigeon Creek flows below the future southbound off-ramp to SR 68. Photo taken May 27, 2011. 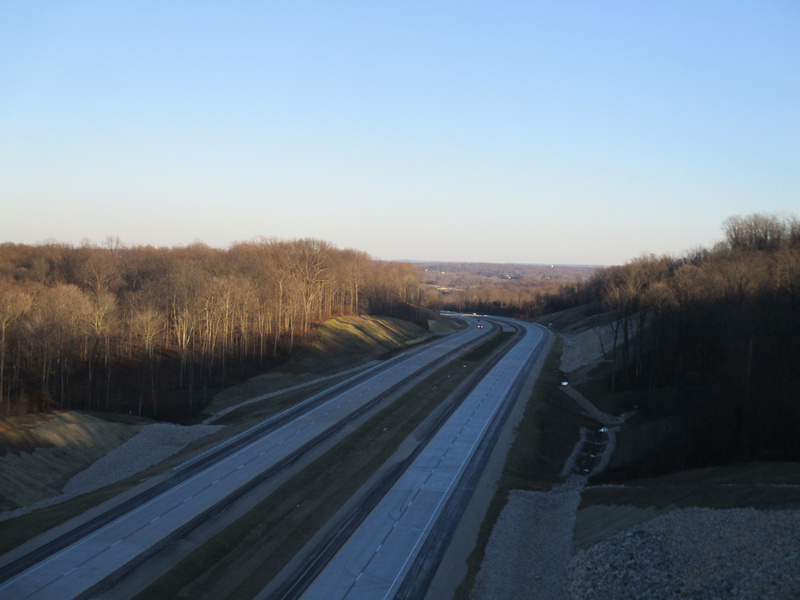 The view of new Interstate 69 from the SR 57 south & 68 overpass showed construction vastly complete by November 7, 2011. 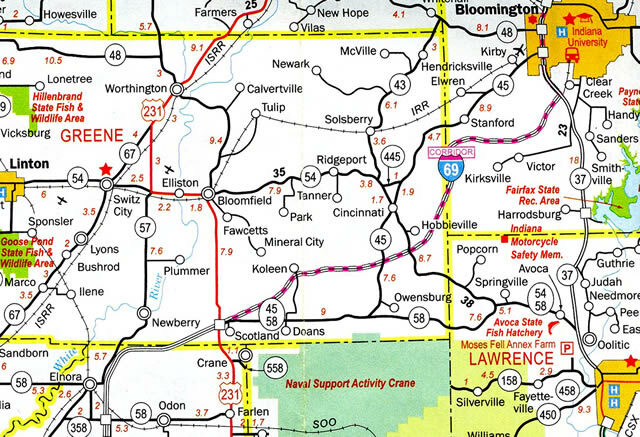 Work on the overall road between SR 68 and SR 37 outside Bloomington continued through December 2015. An Interstate 69 shield accompanies trailblazers for I-64 and U.S. 41 along Veterans Memorial Parkway after the turn off of Riverside Drive by Downtown Evansville. The three-digit width I-69 shield was a replacement of a former Interstate 164 shield. Photo taken 01/01/16. SR 57 joins SR 68 west for a half mile overlap to the diamond interchange with Interstate 69. SR 57 turns southward onto Interstate 69 to I-64. Photo taken 11/07/11. Indiana 64 eastbound at I-69, midway between Francisco and Oakland City. As of 2012, there was no control city for northbound Interstate 69, though judging by the length of the guide sign; it will likely read Indianapolis in the future. Photo taken 11/21/12. Indiana 64 at the southbound on-ramp for Interstate 69 to the west of Oakland City. Evansville is the control city for I-69 south along its new alignment from Interstate 64 north to U.S. 231. Photo taken 11/21/12. Looking west at Interstate 69 from the Harmony Road overpass in Monroe County. This is a ten mile exit less stretch. Photo taken 01/02/16. A new trailblazer added to SR 45 south of SR 37 in Bloomington directs travelers to the segment of Interstate 69 from near Crane southwest to Evansville. SR 45 can be followed to the current end of I-69 at U.S. 231. Photo taken 04/14/13. 82nd Street passes under Interstate 69 & Indiana 37 at a folded diamond interchange (Exit 1) in Castleton. The arterial provides the missing movement between Interstate 69 north and I-465 south via its loop ramps. Photo taken 10/16/04. East 96th Street west at the diamond interchange (Exit 3) with Interstate 69 & Indiana 37. The arterial follows the Marion and Hamilton County line across the freeway. Photo taken 10/16/04. Lower Huntington Road eastbound at the northbound on-ramp to Interstate 69 and U.S. 24-33. The local road splits with Airport Expressway just east of Exit 99, with both roads serving the south side of Fort Wayne. Photo taken 11/06/11. Heading underneath Interstate 69 along Indiana 8 in Auburn, an older sign designates the highway as both Interstate 69 and U.S. 27. 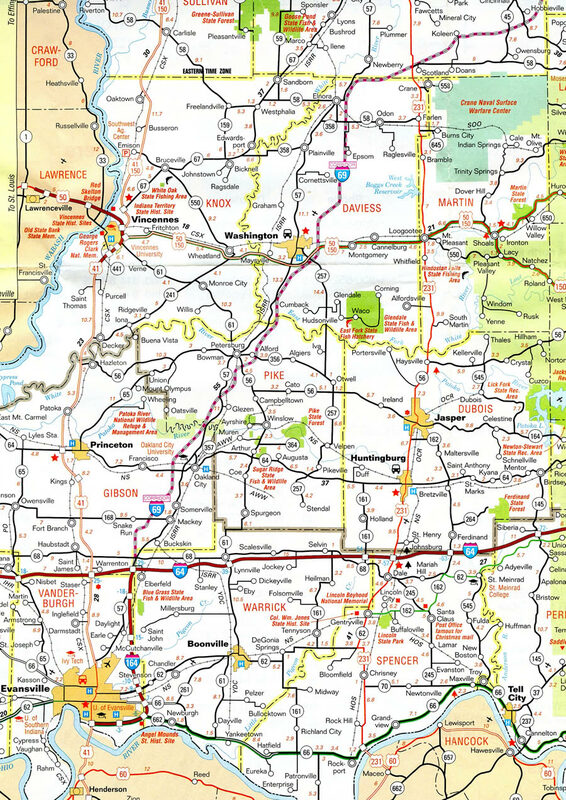 Interstate 69 supplanted U.S. 27 as the main route from Fort Wayne north to Auburn, Angola, Coldwater and Lansing, Michigan. For a while the two were cosigned along the entire drive between Fort Wayne and Lansing. This ended in 2002 when MDOT and INDOT successfully petitioned AASHTO for a truncation of U.S. 27 north of Lansing and an extension of U.S. 127 north from Lansing to Grayling over former U.S. 27 in 2002. Photo taken 02/06/12. Looking west at the ramp from the toll booth off of the Indiana Toll Road (Interstates 80 & 90) near Fremont in Steuben County. Lansing is the northbound control city while Fort Wayne is the one for southbound traffic. A missing space on the left sign indicates a missing US 27 from the time that that highway was routed north from Fort Wayne prior to 2002. Indiana 120 is also reached via the ramp prior to it reaching southbound Interstate 69. Photo taken 02/06/12. Baker Road angles southwest from Michigan to become Lake George Road at the northernmost interchange of Interstate 69 in Indiana. A U.S. 27 shield once lined up beside I-69 on this overhead. Photo taken 11/06/11. Travelers turn onto Interstate 69 southbound from Lake George Road west for a one half mile drive to the Indiana Toll Road and 42 miles to Interstate 469 at Fort Wayne. An Emergency Detour route for Interstate 69 follows Lake George Road west to Old US-27. Photo taken 11/06/11.